In Pennsylvania, the groundhog known as Punxsutawney Phil saw no shadow this year. That is supposed to portend an early spring. In the Rocky Mountains, early springs have been coming no matter what. This was a cold winter in many places, but on average the climate has been warming for several decades. It’s sure to get much warmer yet. A case in point is Colorado’s North Park, headwaters of the North Platte River but a short distance from the headwaters of the Colorado River and also the Steamboat ski area. There, according to Dr. J.J. Shinker, an associate professor from the University of Wyoming, the temperature overall has increased 1.44 degrees Celsius (2.6 degrees Fahrenheit) since 1909. 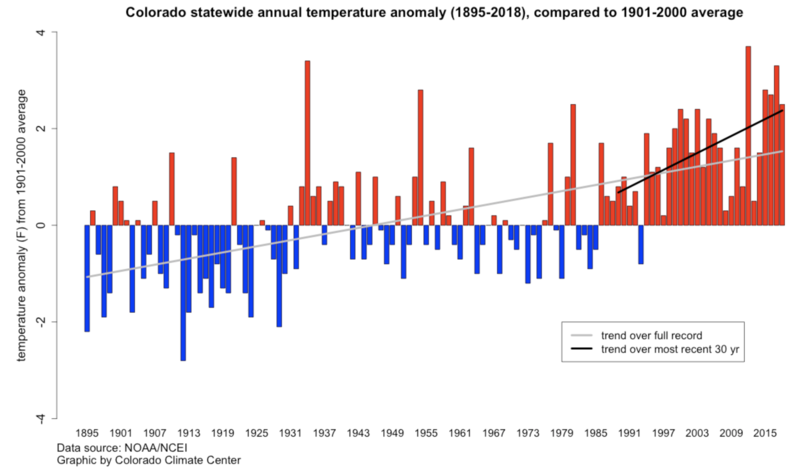 But warming during the spring months of March, April, and May has been disproportionate, rising almost 4 degrees Fahrenheit (2.21 degrees C) on average since 1909. “That’s a lot of warming in a short period of time,” she told members of the Colorado Water Congress at a recent conference. She also pointed out that warming at high elevations has been disproportionately greater than the global average. But of disproportionate warming during spring, there is no dissent. 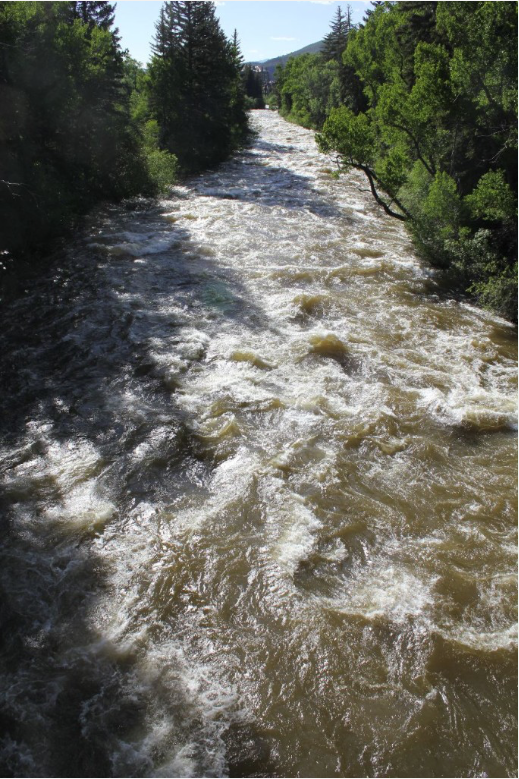 And that produces earlier runoff in the North Platte and other rivers in Colorado. On average, runoff occurs five days earlier for every degree Celsius in warming. This matters to water managers, who try to ensure the irrigation ditches still have enough water come August and September. It also matters to mountain resorts as warming springs shrink the backend of ski season. But everybody should be concerned for two more reasons, says Shinker. First, the worst droughts we’ve seen, the worst on record since Eurosettlement about 150 years ago, don’t come close in depth and intensity to those of the past. Forest fires of the past were also giant affairs. This was part of natural variability. But now there is the overlay of what might be called unnatural variability, this overlay caused by human forcing of the climate. Paleoclimatologists can tell much about shifting climates of the past 12,000 years by studying high mountain lakes. Consider Emerald Lake, which is in Colorado’s Sawatch Range, near the trailheads to the state’s two highest mountains, Elbert and Massive. Scientists studying lake sediments and other clues have documented shorelines that a millennium ago were much lower. The droughts then lasted for decades, even hundreds of years, what are called megadroughts. Lake of the Woods, which is located in Wyoming along the Continental Divide south of Jackson Hole, also offers evidence deciphered by scientists of a megadrought 5,200 years ago. The point, said Shinker, is that natural variability has always occurred in the interior West. So, too have, extreme events, such as the wildfires that accompanied a megadrought in North Park about 2,000 years ago. In the Colorado River Basin, scientists have reached much the same conclusion. Undeniably, there have been several hard drought years since 2000. But Brad Udall of Colorado State University and other scientists have concluded that it’s not a drought as conventionally understood. Rather, rising temperatures have begun causing more evaporation and transpiration, resulting in less water getting downstream. That doesn’t mean conventional climatic forces don’t have swagger. From her post in Wyoming, Shinker studies what causes natural climatic variability in the interior West, such as movement of the polar jet stream north and south. But now there’s an overlay to those natural climatic variations, one created by human activities.